It was great to see so many people joining us at the launch of our campaign to help city cyclists to stay safe. 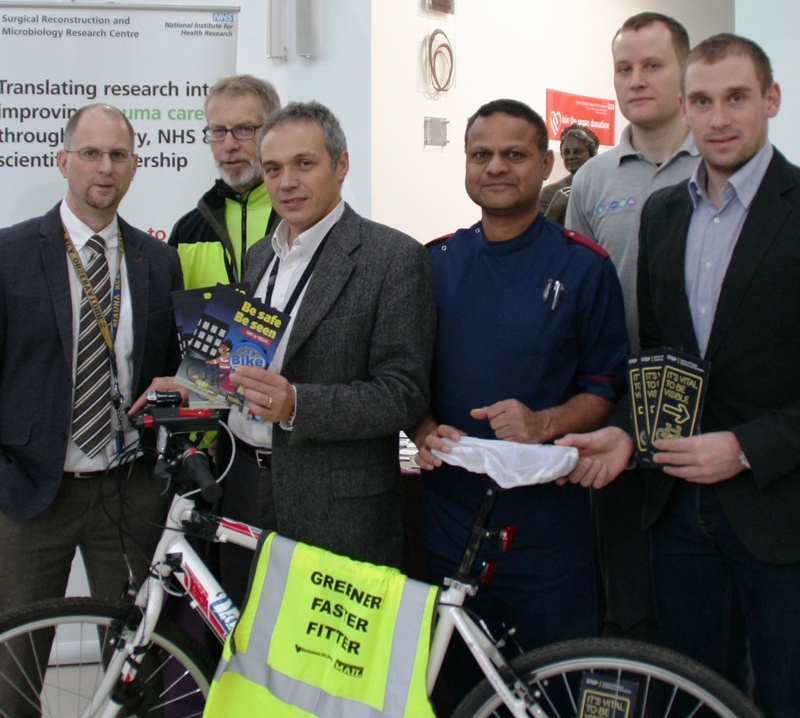 Thanks so much to all who visited our cycle safety stand today in the main entrance of the Queen Elizabeth Hospital Birmingham (QEHB), which has treated up to 83 cycling-related injuries in just one month. For those of you who weren’t able to come down, consultant neurosurgeon Professor Tony Belli and his colleagues in the hospital’s trauma research team kicked off the safety drive with ‘It’s Vital to be Visible’. 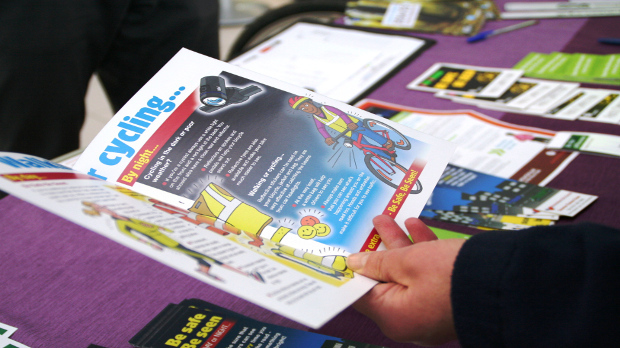 The campaign aims to raise public awareness and reduce injuries by encouraging cyclists to wear protective gear such as high-visibility clothing and helmets and to use equipment such as reflectors and lights to make them more visible to drivers. Professor Belli, Director of the National Institute for Health Research Surgical Reconstruction and Microbiology Research Centre (NIHR SRMRC), said: “QEHB is a Major Trauma Centre and has one of the busiest emergency departments in the UK. “Cycling is a great sport but shockingly, in one month alone, the hospital has treated up to 83 cycling-related injuries. Reflecting the hospital’s statistics, Birmingham City Council has also reported a rise in the number of road traffic collisions in the city involving cyclists when the clocks go back. In the years 2011 to 2013 there were 89 accidents in October and 87 in September. In August there were 70. Representatives from the hospital Trust’s cycling team, Bike Right, On Your Bike and Centro joined the staff on the stand and Professor Belli, pictured third from left, added: “It was great to meet so many people keen to find out more about keeping themselves and their families safe whilst cycling as well as those interested in the studies we are conducting around traumatic brain injury. To find out more about the work of the trauma research team please visit www.www.srmrc.nihr.ac.uk. To show your support for the campaign please tweet using #VitalToBeVisible.